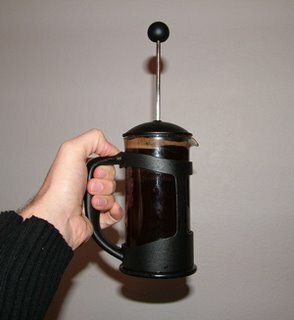 I bought a coffee plunger. So I was busy making myself a delicious cup of the good stuff when I happened to glance upon our timepiece, only to discover that I was running quite late for work. In fact, in order to actually arrive at work on time I would need to either avail myself of some kind of time-machine, or at the very least, have a fair crack at the land-speed record. “Grim!” I said to myself aloud, and meant it. Clearly I would have to streamline my morning routine somewhat, as the coffee-making process had become something of a burden. My day would begin at 5am, when I would meet Andre at our front door with a small bag of fresh beans. Next, I would bang those little suckers in the oven and go for my shower, shave and massage, and get dressed for work. By 6.30am I would be thoroughly clothed and at least partially shod and the beans would be nicely roasted. I would put them onto my window sill to cool. After this, I usually count the beans again to ensure that they are all still there before delicately placing them into my antique Kmart hand grinder. With the beans ground to espresso-perfect consistency I would then deposit them into the humidifier and set my espresso machine to warm. This process takes around twenty minutes and gives me plenty of time to put together a hearty breakfast of Special K and grapefruit. Once the beans are sufficiently moist and the machine, warm, it is simply a matter of drawing a double shot of that liquid gold before jamming it down my gullet and sprinting for the door, stopping only for my keys and hat. As you can see, it’s a tight schedule, but one, for the careful, that could do with a little tweaking. Much to my disgust at my faithful fresh-bean purveyor, Andre (who, I have since discovered is actually my down-stairs neighbour Kevin wearing a sombrero), I found that coffee can be purchased from any two-bit super market, not only pre-roasted but pre-humidified and ground! Thus I was able to dispense with three hefty appliances and approximately two and a half hours per morning. Secondly, I was able to replace my trusty cappuccino machine (which I shall, of course, retain for special occasions, late nights and Fridays) with this handy little French-press, aka coffee plunger. My morning cuppa is now quicker, hotter and just as delicious as it ever was, leaving me more time for the finer things in life – cultivating my tea shrub.